You are currently browsing articles tagged Presbyterian Guardian. It is one thing to take a strong stand for the fundamentals of the faith and come out from that denomination which denies them. It is quite another thing to stand for the essentials of the Reformed faith in the new denomination which you have started with others of similar convictions. This latter matter was the issue facing the early years of the Presbyterian Church of America. For that reason, Professor John Murray wrote a whole series for the Presbyterian Guardian in 1935 – 1936 (its archival material is on-line now) on The Reformed Faith and Modern Substitutes. The latter part of the title dealt with two: Arminianism and Modern Dispensationalism. Readers desiring to get a biblical view of the first substitute are urged to read the Feb 17 and March 16, 1936 issues (Vol 1, numbers 10, 12). The second Modern Substitute was dispensationalism, as it was then being taught and practiced by the Scofield Reference Bible and all kinds of Bible institutes and churches. Professor Murray would deal with this substitute in the May 18, 1936 (Vol. 2 No. 4) issue of the Presbyterian Guardian. Why was this emphasis needed to these Presbyterian pastors and people in the mid-thirties in our Presbyterian church scene? Arminianism may not have been a problem in the infant Presbyterian church, though this false belief can weave its way into many a congregation. Of far greater issue was modern dispensationalism. The fact that there was a concern with their reader’s misunderstanding about the series of articles led one reporter of the Presbyterian Guardian to seek to clarify what was and what was not being said by Professor Murray. What was not being said was that all pre-mils in the church were contrary to the Reformed Faith. It was pointed out that pre-mils could be found on the board and faculty of Westminster Seminary, the Independent Board for Presbyterian Foreign Missions, and the Presbyterian Constitutional Covenant Union. There was no inconsistency between the Reformed Faith and a belief in the premillennial return of Christ. There was to be a wide area of liberty in the doctrine of last things as it dealt with millennial issues. However, what was being said was that the dispensational viewpoint regarding the unity of the Scriptures, the unity of salvation, and the unity of the church was contrary to the Reformed faith. The new church wanted to be in reality as well as in name a Reformed church. And this would come into the forefront of the Presbyterian Church of America with the tragic division of the young church in less than two years in 1938. Words to Live By: Suppose one of your friends, neighbors, work associates would ask you what do you believe about the teachings of your church? How would you answer them? First Peter 3:15 reminds us to “be ready to give an answer.” That word “answer” is where we get our word “apologetics.” It speaks of a defense of the hope which lies within us. But to to do this, you must first know the Scriptures. Read them faithfully and daily. Meditate upon them—dwell upon the meaning of the words and their application, to you, to those around you, to the Church, etc. And most importantly, live out what you have learned. Living according to God’s Word is essential to your deepening understanding of His Word, and thus to your ability to give a faithful defense in testimony of God’s work of salvation in Christ Jesus our Lord. The first mass meeting and rally to challenge and encourage the conservative members in the Presbyterian Church, U.S.A. took place on October 8, 1935 at the Central North Broad Presbyterian Church in Philadelphia, Pennsylvania. The sponsoring organization which called for this first meeting was the newly formed Presbyterian Constitutional Covenant Union. This independent organization had been formed for two purposes: (1) to reform the Presbyterian Church, U.S.A. from the inside, stopping the encroaching apostasy; (2) if that fails, to continue on a true Presbyterian church outside of the PCUSA. 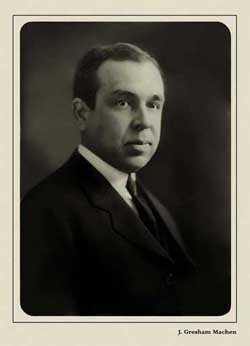 It was this second purpose which caused the most trouble and resulted in many who had originally supported Westminster Seminary and the Independent Board for Presbyterian Foreign Missions to become lukewarm to Dr. Machen and those associated with him. But the latter was not the case at this mass meeting as close to one thousand people came together for this first meeting. The first speaker, as reported by Mr. Thomas Birch of the Presbyterian Guardian in their October 21st edition, was Dr. Charles Turnbull, editor of the Sunday School Times. He spent a good time of his speech showing with much evidence the growing modernism which characterized the pulpits of the land and Sunday School rooms. Challenging the Christian audience to be faithful to the Word of God, and contend earnestly for the Christian faith by supporting the newly formed institutions, like the Presbyterian Constitutional Covenant Union, Westminster Seminary, and the Independent Board for Presbyterian Foreign Missions. Speaking secondly was Dr. J. Gresham Machen, President of the Independent Board and professor at Westminster Seminary. Using James 1:22 at his text, which states, “But be ye doers of the word, and not hearers only, deceiving your own selves” (KJV), the stalwart of the historic Christian faith, outlined the events which led to this crisis of faith in the Presbyterian Church. Speaking last was the General Council of the Presbyterian Constitutional Covenant Union, the Rev. H. McAllister Griffiths. He spoke of future plans of the Union as well as the Presbyterian Guardian. The closing hymn was an apt one, in that the great crowd sang Martin Luther’s hymn, “A Mighty Fortress is our God.” Truly another Reformation was being accomplished by those gathered on that Tuesday night in Philadelphia. Words to live by: We have the advantage of looking back and seeing history as it unfolded. Attempts to reform the Presbyterian Church from the inside went nowhere as the apostate machine simply suspended, for example, two of the three speakers at that meeting — J. Gresham Machen and H. McAllister Griffiths — from the ministry. They were joined by a number of faithful ministers who were also kicked out of the church. So a new church — the Presbyterian Church of America — was formed in 1936 at the last meeting of the Constitutional Covenant Union. The question is really quite simple, dear reader, if you find yourself in a liberal congregation or denomination. You may think that you are holding them back from moving further away from the Bible. But what influence are they having upon you? Are your biblical convictions becoming less and less important to you. Are your stands for righteousness becoming more and more distant and rare? Pray about this fervently, not only for yourself, but for your family, and then acknowledge the sad truth that it is the liberal church who has left you and who has left the faith given unto the saints. Support a Bible-believing, gospel-preaching, Great Commission-fulfilling church today with your membership. Not a sermon this Lord’s Day, but a charge to a congregation, and in this, something to pray about for our pastors and for our churches. It was on this day, May 4th, in 1860, that the Rev. Thomas Smyth brought the pastoral charge to Rev. James H. Thornwell and Rev. Francis Mullaly, who were to serve as co-pastors of the First Presbyterian Church of Columbia, South Carolina. In God’s providence, Thornwell did not remain at this post long, dying on August 1, 1862. Rev. Smyth died in 1873, and Rev. Mullaly served as pastor of ten different churches before he died in 1904. In addition to his pastoral charge, Rev. Smyth also presented the charge to the congregation of First Presbyterian, the text of which is provided below. It is brief, but full of good wisdom for any congregation. To read Smyth’s pastoral charge to Thornwell and Mullaly, with a link to a PDF version, click here. These protracted services should now be properly closed by a charge to the people, and as, in the failure of both the brethren appointed, it has been made my duty to carry out this requirement of our church, you will bear with me, dear brethren, in very briefly addressing you. They are to be strengthened with all might, obtained through your prayers on their behalf. Are they to give themselves wholly to the things which pertain to your spiritual welfare?—you are to provide all things needful for their temporal comforts; to esteem them very highly in love for their work’s sake; to count them worthy of an adequate and honorable maintenance; and to consider it a small thing to impart freely of your carnal things in return for their spiritual gifts. You must be helpers or hinderers of each other’s prosperity and progress. Like priest like people, is not more true than like people like priest. It is in the power of any people to paralyse or to put life and energy into their pastor, and to make him not only a lovely song and as one that playeth well on an instrument, but the power of God and the wisdom of God, to the salvation of souls. And for all that they might do, and ought to do, they must give account when they shall stand confronted at the bar of Him who judgeth righteous judgment. May you so live and labour together as that this account shall be given with joy, and not with grief. Yours, I have said, is a model pulpit. May you be a model people. Model preaching will demand model practice, model piety, liberality and zealous devotion to every good cause. I congratulate you, Brethren, upon the present occasion and your future prospects. I rejoice with you in your joy. I remember your kindness to my youth, and your appreciation of my early ministrations, when you so cordially invited me to live and labour among you. Allow me, with all my heart, to pray that peace may be within your walls, and prosperity within your borders. May you go forward prospering and to prosper—a city set on a hill, a burning and a shining light, provoking all around you to love and liberality. May strength go out of this Zion, and may you arise and shine the glory of the Lord having arisen upon you. This occasion must now close, but we who are now assembled must meet in review all the issues of this rehearsal. Oh, my friends, realize and lay to heart the hastening hour. Pray, oh, pray earnestly, that when pastors and people shall meet face to face, at that awful tribunal, instead of mutual upbraidings and reproaches—you accusing them of unfaithfulness or negligence, and they accusing you of coldness, formality, and refusal to come up to the help of the Lord against the mighty—you may be able to congratulate each other; you blessing God for them as helpers of your faith, and they presenting you to God as their joy and crown of rejoicing. The time is short. These earthen vessels cannot hold out to any of us much longer, though the riches they contain may never fail. For myself, especially, the time of departure must be near at hand. And oh, my beloved Brother, (looking towards Dr. Thornwell), if permitted to become an indweller in the new Jerusalem, how shall I long and look for your coming! And when intelligence of your approach shall be conveyed by ministering spirits, with what alacrity and ardour of love shall I ascend to the loftiest heights of its projecting battlements, and as the seraph minstrelsy announces your approach, how shall I exulting spring to catch you by the hand, and welcome you to the kingdom and the crown prepared for you; to the white robe, and the palm of victory; to the harp of melody; to everlasting joy; to communion of soul, as well as communion with saints and angels; to the river of life and the tree of life; and above all, and beyond all, to Jesus the light and life of all, and Himself the heaven and happiness of all His faithful followers! Talk about Goliath against David. This was the case on this day April 28, 1937 when the Presbyterian Church in the United States of America went to court against the Presbyterian Church of America. They had been successful in winning the church properties of those ministers who had been suspended from their ranks. They had been successful in evicting them from the manse or parsonage. They had been successful in removing their life insurance policies. Now they wanted their name. Their argument was simple. Plans had been under way for some time for a proposed union of the United Presbyterian Church of North America with the Presbyterian Church in the United States of America. And one of the names floated for that proposed union was the Presbyterian Church of America. The principal witness for the Presbyterian Church, U.S.A., was the denomination’s Stated Clerk, Lewis Seymour Mudge. Key to the whole case was the question of similarity of names as the sole basis for the suit against the Presbyterian Church of America. Attempts by the latter group to show the doctrinal reasons for the new church were then met with objection after objection by the attorney for the Presbyterian Church, U.S.A. Witnesses for the P.C. of A. were a “who’s who” of its early leaders. Ministers Paul Woolley, Edwin Rian, and Charles Woodbridge all testified on April 28 and April 29. 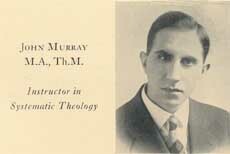 Professor John Murray tried to bear witness about the doctrinal differences between the two denominations, but was hindered by objections to his presence on the stand. He left, without testifying. It took several months before the decision was handed down. But as the historical devotional for February 9, 1939 showed, the decision was made against the Presbyterian Church of America. Moderator R.B. 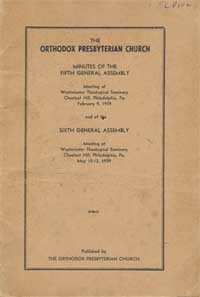 Kuiper called for an earlier than usual General Assembly in that month of February, 1939, and the new name of the Orthodox Presbyterian Church was chosen by the church. When the union between the Presbyterian Church of the United States of America and the United Presbyterian Church of North America took place in 1958, their new name was the United Presbyterian Church in the United States of America (UPCUSA). In God’s providence, this gave the opportunity for the southern Presbyterians who left the Presbyterian Church in the United States in 1973 to choose the name, The Presbyterian Church in America, as their new name during their second General Assembly. Presbyterian Guardian managing editor Thomas R. Birch remarked at the close of his report in the May 29th, 1937 issue, “And once more . . . Gideon’s band of true Christians, the Presbyterian Church of America, has publicly taken its unflinching stand on the side of historic Presbyterianism and the principles of religious liberty for which the fathers fought and died.” His entire article concerning the injunction can be read online in the May 29, 1937 issue of the Presbyterian Guardian. Yet through further legal appeal, it was not until March 15, 1939 that the denomination officially changed its name to The Orthodox Presbyterian Church. 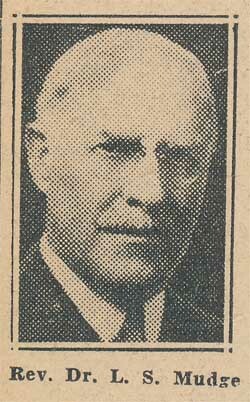 Mr. Birch wrote again at that time regarding the name change, “What’s In A Name?”, on page 47 of the March 1939 issue of The Presbyterian Guardian. Words to Live By: Jesus promised His followers that they would be brought up before the courts for the sake of their profession as Christianity. This was one such example, and it will not be the last time in the history of the Christian church. Yet God’s Word is sure. Remain steadfast to the faith, and God’s reward will be ultimately yours in Christ. The Constitutional Covenant Union was an independent agency organized after the 1935 General Assembly of the Presbyterian Church, U.S.A. That national meeting brought some powerful indications that the conservative Presbyterians days were numbered in the visible church. So there went out a call to the supporters of the true Presbyterians to come to Philadelphia for a meeting on June 27, 1935. Over one hundred people answered the call. The Constitutional Covenant Union was organized, with officers elected, an executive committee named, and a constitution adopted. Chapters were to be organized, and a program of reform of the Presbyterian Church USA promoted. The meeting in Philadelphia would last from June 11 to June 14. It was upon its closing promptly attacked by not only the church machine of the denomination, but also from a surprising corner in the Rev. Samuel Craig, editor of Christianity Today. The latter magazine had been set up by Samuel Craig to expose the apostasy of the Presbyterian Church USA. But there were changes being made in his purposes around this time. Instead of supporting the Independent Board for Presbyterian Foreign Missions, he had resigned from both it, and the Board of Trustees of Westminster Seminary. Now Craig was advocating the support of sound missionaries of the official Board of Foreign Missions. When that became known, the Rev. McAllister Griffiths resigned as managing editor of Christianity Today, and became the editor of the Presbyterian Guardian. Words to Live By: J. Gresham Machen said on this occasion that we cannot trust the world. We cannot trust civilization. We cannot trust the visible church. When God speaks through His Word, we can trust only Him. His words are still true today. Make the Word of God be your guide this day. 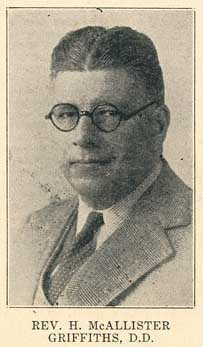 Early in 1930, the Rev. Samuel Craig had been dismissed from his position as editor of the Philadelphia-based periodical, The Presbyterian. Wasting no time, Craig quickly established the Presbyterian and Reformed Publishing Company, in part with investment capital supplied by Dr. J. Gresham Machen. The first publication of the new firm was a monthly magazine titled Christianity Today, and this magazine was issued consistently from May, 1930 through the Spring of 1941. Thereafter the magazine was issued sporadically until the final issue of May, 1949. Another magazine, which currently bears this same name, began in 1956 and was originally based in Washington, D.C. It bears no connection, other than name, with Dr. Craig’s publication. May 4: What Constitutes Schism? 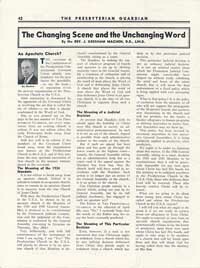 In the May 4, 1936 edition of the Presbyterian Guardian (now on-line), Dr. J. Gresham Machen wrote an article on a proper definition of schism. The times in which he was writing were perilous times for both Reformed ministers and the members of their churches. Already a Mandate had been passed by the 1934 General Assembly of the Presbyterian Church, U.S.A., which threatened suspension of any elder, teaching or ruling, who would support by their presence, purse, and prayers any board outside of the denominational boards. Indeed, young pastors could not be received into churches or presbyteries who refused to support the official boards of the church. In the midst of this, a Presbyterian Constitutional Covenant Union had been set up by the small Presbyterian conservative faction in the church. One of the principles of that Covenant union plainly contemplated separation from the main-line church if it continued in its apostasy. Responding to that Covenant Union were those ministers and churches who denounced the sin of schism, plainly inferring that any who contemplated separation would be guilty of the sin of schism. It was that false charge which Machen proceeded in this article to refute, and refute very strongly. Consider his words here. He wrote just eight months before his untimely death, “It is not schism to break away from an apostate church. It is a schism to remain in an apostate church, since to remain in an apostate church is to separate from the true church of Jesus Christ.” He then went on to explain that as of May 4, the Mandate of 1934 and 1935 had yet to be declared constitutional. It was simply an administrative pronouncement up to that time. If the General Assembly of 1936, to be held in several weeks, approved it, then it would be an action of the church. If that happened, as we know from the position of hindsight that it did, then all true believers had it as their duty to depart from the denomination because that church had placed the word of man above the Word of God and has dethroned Jesus Christ. Dr. Machen was seeking to go to the last measure to keep the church from going down this path of apostasy. Yet it would be a vain seeking as the May 1936 General Assembly did approve the Mandate of 1934, and the die was cast. All those ministers, who had rejected the earlier Mandate, and had appealed to the next highest court their suspension from the ministry by their respective presbyteries, had their appeals denied. To read the full article by Dr. Machen, click here. Words to Live By: God alone is Lord of the conscience and has left it free from any doctrines or commandments of men, (a) which are in any respect contrary to the Word of God,or (b) which, in regard to matters of faith and worship are not governed by the Word of God. Regrettably a day late, but as we haven’t shared any Machen news lately, we’ll squeeze this one in. The following news item appeared in THE PHILADELPHIA BULLETIN on April 22, 1936. This news clipping is from the scrapbook collection gathered by the Rev. Henry G. Welbon. When the General Assembly did meet, Machen and the others were suspended, as was expected, and so the split did occur, less than two months later, though admittedly the numbers that left the old denomination were surprisingly few by comparison. “If the General Assembly of the Presbyterian Church in the U.S.A., at its meeting next month, confirms the suspension of five Philadelphia militant Fundamentalist clergymen from the ministry then there will be a split in the Church. This assertion is made today by the Rev. Dr. J. Gresham Machen, of Westminster Theological Seminary, 1528 Pine St., leader of the militant faction and one of those under suspension. 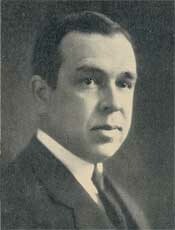 “If that action is taken by the General Assembly,” says Dr. Machen, “some earnest people, at very great sacrifice of worldly goods and with bleeding hearts, will leave church buildings, hallowed for them by many precious memories, and will sever their connections with a great church organization. “If the Church should say ‘No’ to reform, in such fashion as to demonstrate that reasonable hope of purification is impossible, true Christian men and women would, we believe, be obliged to separate themselves from an apostate organization. The five local clergymen who have been ordered suspended from the ministry because of their refusal to obey the General Assembly Mandate and resign from the Independent Board for Presbyterian Foreign Missions, in addition to Dr. Machen, are: the Rev. H. McAllister Griffiths, editor of the Presbyterian Guardian; the Rev. Merril T. MacPherson, minister of Central North Broad Street Church; the Rev. Edwin H. Rian, of Westminster Theological Seminary, and the Rev. Paul Woolley, of the Independent Board and also of Westminster Seminary. At Columbus, O., yesterday the Rev. Carl McIntire, youthful pastor of the Collingswood, N.J. Presbyterian Church, lodged three complaints against the Presbytery of West Jersey with the permanent judicial commission of the church. The complaints resulted from McIntire’s conviction by the New Jersey Synod on charges similar to those against the Philadelphia minister. The first complaint charged that the Presbytery erred in starting McIntire’s trial after a constitutional stay signed by more than one third of the members had been obtained. The second charged that the Presbytery rescinded illegally an overture to the general assembly to “clean up” the regular board of foreign missions of the church, after it had been passed with only one dissenting vote, and the third charged the Presbytery with violation of the constitutional right of ministers to protest actions, and have their protests made a matter of record. The number “seven” has always been associated with perfection. But while that is the belief, there would be no one who would suggest that the seventh opening exercises of Westminster Theological Seminary on October 2, 1935, have this word “perfection” stamped upon it. Yet there was a sure reminder of both their existence in the church world at that moment in history as well as an old challenge to the professors and student body that they were to “contend earnestly for the faith which was once for all delivered unto the saints.” That very familiar text from Jude 3 was the title of the sermon and article in the Presbyterian Guardian of October 21 and November 4 in 1935. There were some sobering statements in this quotation. There is no doubt that the New York City pastor wanted to impress on the minds and hearts of the seminary students that their studies must produce some effects in the lives of those to whom they would be sent as servants of Christ. Words to live by: Standing out in the above quotation is the illustration and application of the child. Dr. McComb said, “when a child is born into this world and utters no sound, we fear that it is dead. When a professing Christian never speaks a word regarding his Redemption through Christ, we have reason to suspect that he never has been born again.” These are strong words, and may solicit objections by our readers. Yet there are placed here to think upon them and more importantly to act upon them. Pray for a divine opportunity this day or week. Pray that the Spirit will remind you to recognize the divine opportunity. Then simply relate your Christian testimony to the individual, and see what the Lord will bring forth. “It is lawful for Christians to accept and execute the office of a magistrate, when called thereunto: in the managing whereof, as they ought especially to maintain piety, justice, and peace, according to the wholesome laws of each commonwealth; so, for that end, they may lawfully, now under the new testament, wage war, upon just and necessary occasion.